The goal of this project is to develop new image reconstruction methods for accelerated data acquisition to improve the quantitative analysis of functional imaging. Accelerated image acquisition is achieved with subsampling of kspace, but as this violates the Nyquist sampling theorem, it leads to artifacts in conventional image reconstruction methods. It is possible to reformulate the image reconstruction process as an inverse problem. Using tailored acquisition strategies like non Cartesian sampling patterns, and by using multiple receiver coils, it is possible to introduce a priori knowledge in the reconstruction. 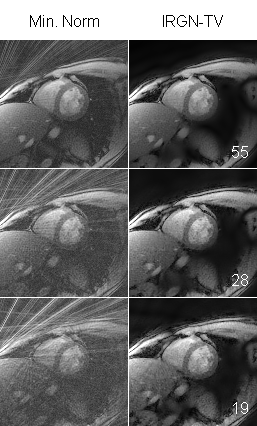 This allows the reconstruction of images with reduced artifacts (see Figs. 1,2) [1,2,3,4]. A major drawback of these image reconstruction strategies is the high computation time which makes it impossible to use them in daily clinical practice. Efficient implementation of the algorithms, e.g. by using the computation power of modern graphics hardware is also a key point of the project . If you are interested in reconstruction code, our GPU image reconstruction library AGILE may be of interest to you. It includes a CUDA implementation of TGV image reconstruction . In addition, Matlab Code is available for the method proposed in . Update: I moved to the group of Prof. Daniel Sodickson at the NYU medical center. My page at NYU. Fig.1: Radial Brain Scan: Clinical 3T Scanner, 32 Receiver Coils, 256x256 Matrix, 32 (top row) and 24 (bottom row) radial projections. Left: Conventional reconstruction method with streaking artifacts. Right: Image reconstruction with a Total Generalized Variation (TGV) constraint . Fig.2: Radial Cardiac Real-Time-FLASH Scan: Clinical 3T Scanner, 32 Receiver Coils, 128x128 Matrix, 55 (top row), 28 (middle row) and 19 (bottom row) radial projections, corresponding to temporal resolutions of 110ms, 56ms and 38ms. Left: Conventional reconstruction method with streaking artifacts. Right: Nonlinear Parallel Imaging Reconstruction with a variational constraint (IRGN-TV) . Knoll, F.; Clason, C.; Bredies, K.; Uecker, M.; Stollberger R.: Parallel Imaging With Nonlinear Reconstruction Using Variational Penalties. Magnetic Resonance in Medicine, 67 (2012), 34 - 41. [Matlab code]. 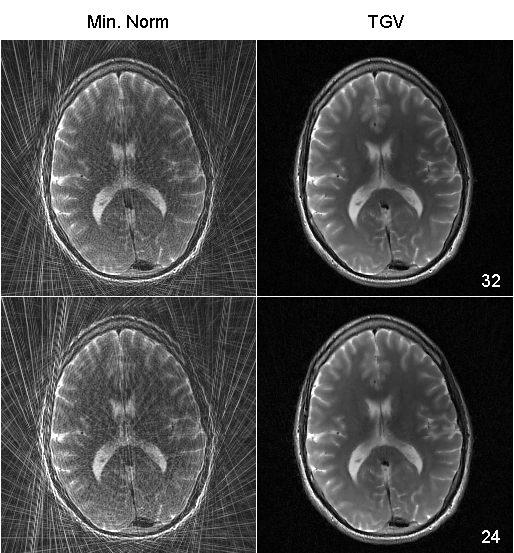 Knoll, F.; Bredies, K.; Pock, T.; Stollberger, R.: Second Order Total Generalized Variation (TGV) for MRI. Magnetic Resonance in Medicine, 65 (2011), 480-491. Knoll, F.; Clason, C.; Diwoky, C.; Stollberger, R.: Adapted Random Sampling Patterns for Highly Accelerated MRI. Magnetic resonance materials in physics, biology and medicine, 24 (2011) 1, 43 - 50. Knoll, F.; Schultz, G.; Bredies, K.; Gallichan, D.; Zaitsev, M.; Hennig, J.; Stollberger, R.: Reconstruction of undersampled radial PatLoc imaging using total generalized variation. Magnetic Resonace in Medicine, in Press (2012). Knoll, F.; Unger, M.; Diwoky, C.; Clason, C.; Pock, T.; Stollberger, R.: Fast reduction of undersampling artifacts in radial MR angiography with 3D total variation on graphics hardware. Magnetic resonance materials in physics, biology and medicine 23 (2010) 2, 103 - 114.